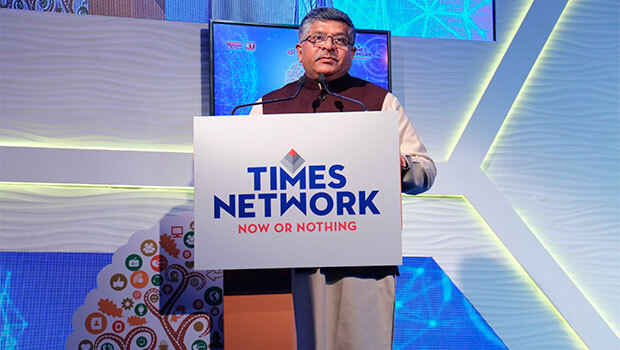 The Times Group launched the fourth edition of its ‘Times Network Digital India Summit and Awards 4.0’ on December 16. The summit was aimed at deliberating on key challenges and laid out key imperatives and framework for turning the vision of ‘Digital India’ into a reality, through a series of panel discussions and deliberations. The summit kicked off with the keynote address by Union Minister for Law & Justice and Electronics and Information Technology, Ravi Shankar Prasad. The participants at the first session of the panel discussion themed ‘Digital India- Where Do Things Stand? A Real Time Assessment’ were Aruna Sundararajan, Secretary, DoT; Debjani Ghosh, President Designate, Nasscom; Rajkiran Rai, MD & CEO, Union Bank of India; Sri Rajan, Chairman, Bain & Co India and Karan Bajwa, MD IBM India. Ravi Shankar Prasad said, "Digital India, which is a flagship initiative of the government is designed to empower and to help the poor and the underprivileged. We are focusing on providing the affordable and inclusive digital media to the masses. Today we have well over 1 billion mobile phones in the country with 350 million being smartphones, which defines the digital identity of the nation. Low-cost technology for inclusive growth is crucial." Commenting on Times Network Digital India Summit 4.0, MK Anand, MD & CEO, Times Network, said, "Over the last three years, Digital India Summit and Awards has enjoyed tremendous response from both delegates and participants alike. With unwavering focus on building a digitally empowered India, the fourth edition of Digital India Summit is another step towards bridging the 'digital divide' and finding solutions and opportunities to create a robust security architecture." Rajan S Mathews, Director General, COAI speaking on the vision of 5G in India emphasised on the periphery of competitive landscape of the telecom industry. He said, "We need to position ourselves in the telecom industry with the spectrum auctions pricing methodology. We need more spectrum in the upcoming time to leverage the last customer of a telecom company." Dr. TP Krishnan, Secretary, Ministry of Skill Development and Entrepreneurship, addressed a panel discussion on the theme of 'Developing A Digital Workforce-The Ground Realities'. He said, "Skills acquisition needs to be more aspirational. Our jobs are not aspirational. Soft skill development programmes, including life skills and ITI, which are the game changers under the skill India campaign of the government, can play a pivotal role in shaping the skill development sector in this country."